The Amur cork tree grows naturally in the Far East, in Korea, China and Russia. It is found with other broadleaf trees and demanding conifers in mixed forests on rich mountain slopes and river valleys. The broad picturesque habit combined with the attractive bark and rich foliage make this species one of the most beautiful to be found in Finland. It is at its best in autumn when it turns a brilliant pale yellow, which lasts only briefly until leaf fall with the first frosty nights. The small green flowers are negligible but the black oily berries are showy – if inedible - in autumn. Both foliage and berries are strongly aromatic. The Amur cork tree is related to the citrus family, not to the cork oak (Quercus suber), whose bark is used for making bottle corks, though the bark of the Amur cork has occasionally been used for this purpose in East Asia. The Amur cork has an undeserved reputation for being less than hardy. The old trees at Mustila have survived the coldest winters of the 1940s and again those of the 1980s. But it is essential to use suitable provenances and to grow the seedlings in protected conditions. 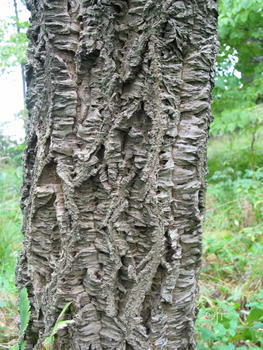 The Amur cork is adapted to the steady climate and warm summers of its native range, which makes it sensitive to both spring and autumn frosts when young.